Although this book is published in a series entitled 'Philosophical Studies in Contemporary Culture' (edited by H. Tristram Engelhardt, Jr.), the bulk of its content concerns the way in which the virtue of temperance was theorized by Aristotle and Thomas Aquinas and the way in which the ideas of Sir William Osler (1849--1919) and his doctrine of aequanimitas represents a modern articulation of this virtue in the context of medical practice. Just how this relates to 'contemporary culture' is not immediately clear. 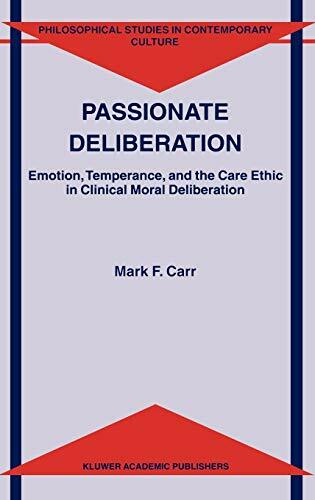 The thesis of the book is that clinicians are in need of the virtue of temperance (or of aequanimitas) so that their judgments and decisions might not be overly influenced by inappropriate emotion. Mark Carr, who teaches in the Faculty of Religion at Loma Linda University in California, draws a scenario in which a medical team needs to make a decision whether to place a dying patient on dialysis for his failing kidneys. The medical indications are that such treatment would be futile. However, the team observes the patient's young son in tears by the bedside. The lead physician says, "Now if that doesn't make a difference in the way we think of that man's treatment, nothing will!" It is to explore just what difference it should or could make that Carr then embarks upon his exploration of the virtue of temperance. He returns to his scenario at the end of the volume in order to deliver his judgment. This situating of the problem places stress on the way in which temperance might be considered a mode of management of our emotions. Whereas the common conceptions surrounding this virtue concerns the management of our desires, Carr brings a considerable body of scholarship and a sophisticated philosophical psychology drawn from Thomas Aquinas to bear on the question of what the role of temperance is and of what the emotions are and how they are to be managed. Temperance is not so much a matter of restraining or suppressing the passions as of giving them careful direction and guidance. Given that the emotions are importantly cognitive as well as being affects, temperance becomes in part an intellectual virtue. Carr explores the concept of temperance with reference to its origins in classical Greek philosophy, when it was variously thought of as a balance between parts of the soul (Plato), moderation in one's desires and inclinations (Aristotle), or more narrowly as a suppression of unruly affects (the early Stoics). Carr does a lot of work analyzing both primary and secondary texts in relation to temperance before turning towards modern cognitive conceptions of emotion. These in turn are compared to the rather arcane philosophical psychology of Aquinas in order to demonstrate that 'the virtue of temperance helps us act and feel in a morally appropriate manner' (96). This supports the claim that the importance of temperance is to enable sound judgment on the part of practical reason. Such sound judgment is appropriately affected by relevant and appropriate emotion. Carr's discussion of the work of Sir William Osler on the notion of aequanimitas seeks to show that Osler was not espousing a cold and dispassionate approach to patients but rather a form a temperance moderating the concern and empathy that clinicians would appropriately feel towards those in their care. Carr goes on to applaud the care ethic in contemporary clinical thought but calls for a balance between such emotion and intellectual and cognitive elements in decision making. Just how this balance is to be struck is not theorized in general terms. This is the particularist task given to the virtue of temperance. And so the conclusion is that the emotions and such 'affiliative virtues' as caring are appropriate in clinical practice, along with scientific clinical reason, provided they are moderated by the virtue of temperance so as to yield 'care-ful, rational, moral deliberation' (157). We should evaluate this book with reference to its intended audience, which the cover tells us is: 'upper-level undergraduate and graduate-level students interested in ethics, bioethics, moral psychology, Oslerians, and students of Aristotle and Aquinas' view of the moral virtues.' It certainly would not be of interest to clinicians or others working in the health and helping professions. It is much too scholarly a book for that. I wouldn't recommend it to undergraduate students either. But would even scholars enjoy it or profit from it? The problem that I find with the book is that one seldom hears Carr's own voice. He constantly makes his points by quoting other authors. It is as if we have his literature review but not his own theses. Certainly he tells us what he wants to argue for but instead of argument we get a fragmented series of citations with all too brief commentary. While Carr's scholarship is impressive one wishes that he would leave it behind and simply tell us what he himself thinks. Perhaps more important than this annoying stylistic point, the conclusion seems to give us too little guidance. That there should be a balance between emotion and reason is a platitude, albeit one that has been won with painstaking care. While texts in virtue ethics cannot consistently offer ethical principles, they should give us more than one example on which to test our intuitions and on which to develop a sense of the kind of balance that the virtue of temperance requires. There should have been many more case studies than just that of the dialysis patient so that the reader could develop a feel for the kind of judgment a clinician with the virtue of temperance is likely to make. Only this would guide us as to the kind of judgment clinicians should make.